What makes this bracelet different is that it is personally charged with Reiki for the wearer. Kalyn Wolf is a Reiki Master and since 1985 she has been using Reiki and other healing modalities to personally charge objects for grounding and balance. That added to the chakra colors and essential oils may give you a sense of peace and happiness you haven’t previously sensed. The beads in a chakra bracelet can be made of many materials, but the colors are very important. Each of the chakras is represented by a color — violet/white, indigo, light blues, green/pinks, yellows, orange, and reds. The only essential feature of a chakra bracelet is that its wearer understands its significance. 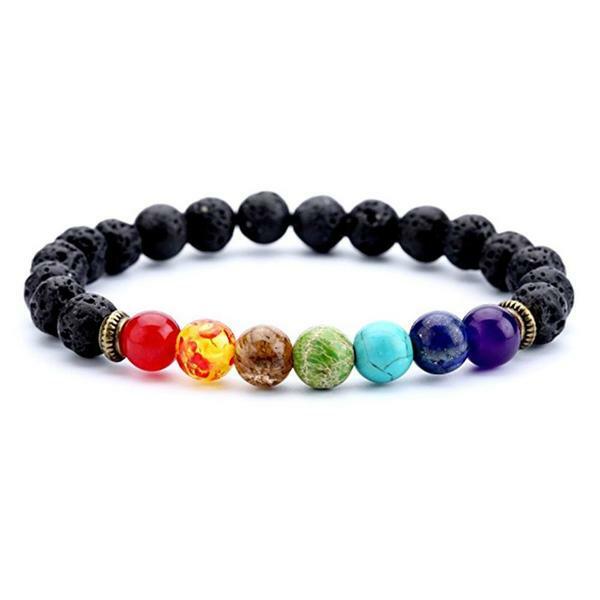 Not every rainbow colored bracelet is a chakra bracelet, but all bracelets colored this way can be worn as chakra bracelets and thereby achieve the intended balancing and healing effects.